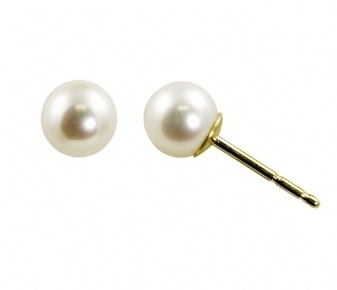 Akoya pearl studs, white with slight rose undertones, 7mm, saltwater with 14k yellow gold, very classic, goes with almost everything? 7mm diameter: A moderate to large size, for a more dramatic look. This size shows off the luster of these pearls well. AA Quality: “Extra Fine” – Deep lustrous nacre coating, very well matched color and clean surface. Hollywood icons like Elizabeth Taylor and Rita Hayworth donned our pearls in the 1950s; in the 1980s, First Lady Nancy Reagan was an Imperial fan. Imperial’s storied history traces back the 1892 establishment of Deltah, one of America’s first fine jewelry firms; and the 1917 founding of the Imperial Pearl Syndicate. In the 1970s, Banice Bazar purchased and merged the companies to establish the singular brand: Imperial. Today, with three generations of the Bazar family leading the global Imperial brand, we remain family owned and operated.